Gotland is a small nation in Scandinavia, occupying the namesake island of Gotland. They do not exist in any campaign starts, but can be released as a vassal or as a result of rebels. 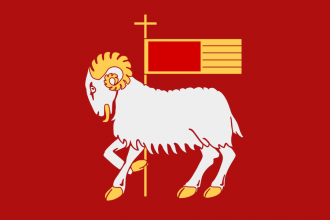 Gotland is a difficult nation to play as, due to its isolation and the powerful nations surrounding it. Since Gotland doesn't exist at the beginning of the game, the player must start as Denmark and release Gotland as a vassal. To make the game easier the player may choose to lower relations with Poland, Muscovy, Norway, and Sweden. After this is done, defeat the rebels on Gotland, release Gotland and select to play as released vassal. Gotland, Sweden, and possibly Norway will be vying for independence. Since Denmark likely doesn't have alliances with Muscovy or Poland, it should be easy to win independence with Sweden and Norway. If its not possible to get any Danish land in this war, just wait until the next. Once Gotland controls most of the Danish land and a decent military, invade Riga and the Livonian Order. Get an alliance with Muscovy and invade Novgorod. It may be beneficial to invade Tver as well, if possible. Squeeze the wealthy lands out of Novgorod and leave the rest between Muscovy and Sweden. After the player has the St. Petersburg area, release Finland as a vassal. They will be beneficial later when at war with Muscovy or Sweden when they are weak. Later options include attempting to wreck the HRE or beat up the Commonwealth with a new 50k army. This page was last edited on 7 July 2018, at 14:29.